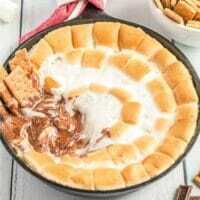 This S’mores Dip recipe is seriously as good as eating a freshly roasted s’more on a summer night! That is definitely my favorite thing about summertime: bonfires and s’mores. But, having this dip recipe means you don’t have to wait for summer to come around to enjoy the delicious, gooey, marshmallow and chocolatey goodness. For more awesome dessert dips, try our funfetti dip, cookie dough dip and our pumpkin cream cheese dip. Who doesn’t love s’mores? They have to be one of everyone’s favorite treats. 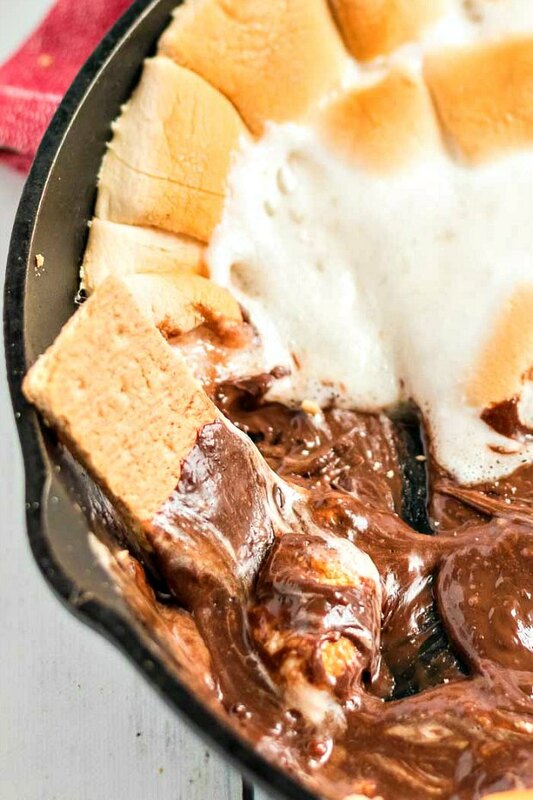 Kids go crazy for this s’mores dip recipe. BUT, secretly, I do too. It makes you feel like a kid again the second you taste the graham cracker, crispy marshmallow, and melted chocolate. It’s so easy to make and it’s just so delicious. It’s the perfect dessert when I want to do something fun and different. This recipe couldn’t be any easier, either. 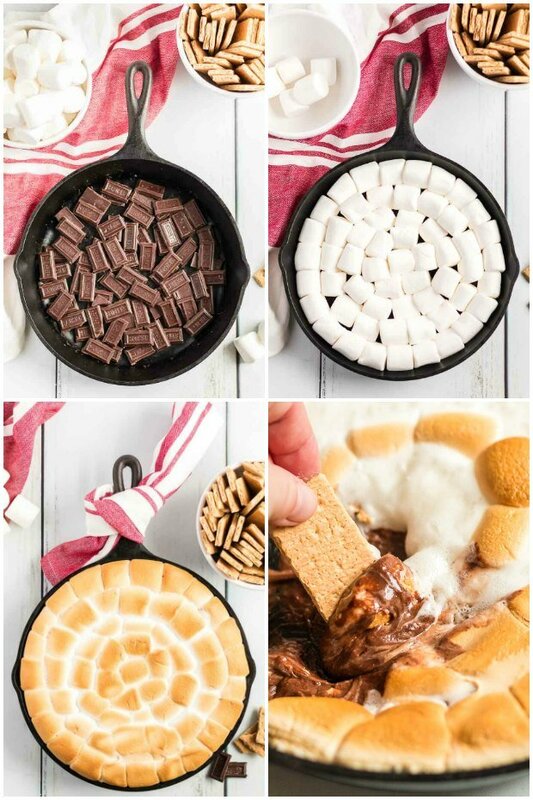 As long as I have the ingredients needed to make s’mores, I can whip this together. You can find the full recipe at the end of the post. In a greased cast iron skillet, place a single layer of chocolate on the very bottom. It works best if you break the chocolate into small pieces (as shown in the picture). Also, the chocolate doesn’t have to be placed one by one, you can kind of layer them in the bottom of the pan. Then, top the chocolate layer with marshmallows. Try to evenly place the marshmallows. It’s okay if there are small gaps between them, as the marshmallows melt they will fill in the gaps. Cook these two for 10-15 minutes, or until the marshmallows are golden. Take it out of the oven and let it sit for about 5 minutes. Serve the s’mores dip with graham crackers for dipping and enjoy the gooey deliciousness! Graham crackers are always my go to. 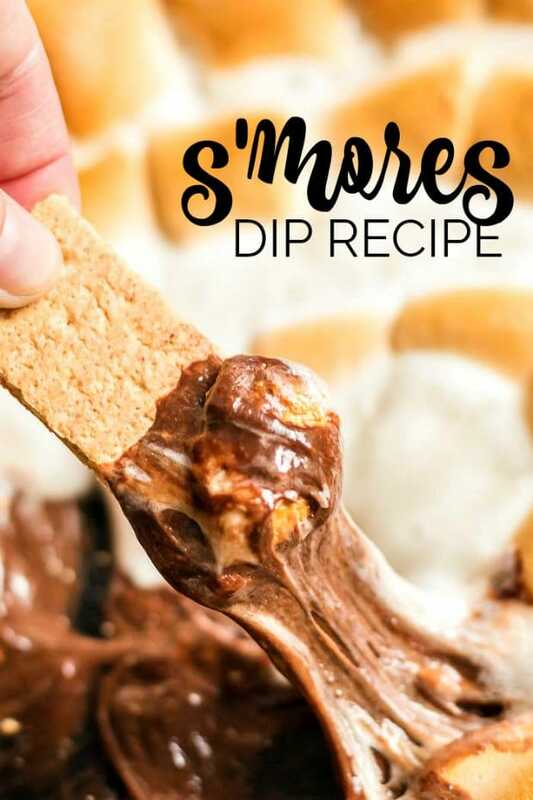 They are classic with s’mores and work well for dipping because they tend to hold up well and don’t break as you dip them! However, you can get creative with your dipping options! My best friend is a huge fan of salty and sweet, she swears by dipping potato chips in her s’mores dip. Another option for the salty-sweet lovers is pretzels. I’ve tried the pretzels and found it to be soooo delicious! Besides Graham crackers, I also like to dip vanilla wafers in them as well or if I’m really in a chocolate mood I will break out the Oreo cookies! If I am trying to keep it a bit on the “healthier side” we will go with apples or strawberries. It’s fun to rummage through the fridge and cupboards to see what we have and what we think might go good with the s’mores dip. This recipe is so fun to make and even more fun to eat. You can easily throw together, with very little ingredients or time required, and it’s a recipe that’s bound to get you loads of praise from the kids. 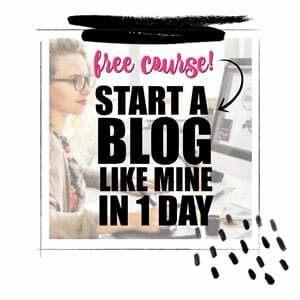 Make sure you get a couple of dips in quick because chances are, it won’t last long! Chocolate Pudding Cake <- the sauce is amazing! In a greased cast iron skillet, place chocolate in a single layer. Top with marshmallows. Cook for 10 - 15 minutes, until marshmallows are golden. Let sit 5 minutes. Serve with graham crackers for dipping.